Find hotel near The Clifton Suspension Br .. The Clifton Suspension Bridge is a suspension bridge which opened in 1864 from Avon Gorge and the river Avon. The bridge is a beautiful marvel of architecture and design and so is a must go for all tourists. Spectacular and picturesque views are what the place is all about. An experience of a life time, the place is the best way to see panoramic view of the city. Prices are for crossing 50 times. Prices also depend on the number of crossings. Ashton Lodge (E-bound) is the nearest bus stop and you can get a bus from there. Rentals and taxis are also available in the place. 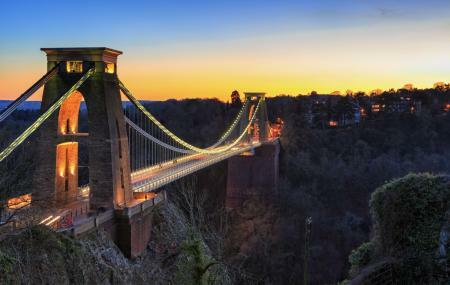 How popular is The Clifton Suspension Bridge? People normally club together M Shed, Princes Wharf and The Circus And The Royal Crescent while planning their visit to The Clifton Suspension Bridge. Do you get any concessions with a blue badge and a higher rate disability? Though there is a parking space for blue badge holders, I do not think there is any special concession.